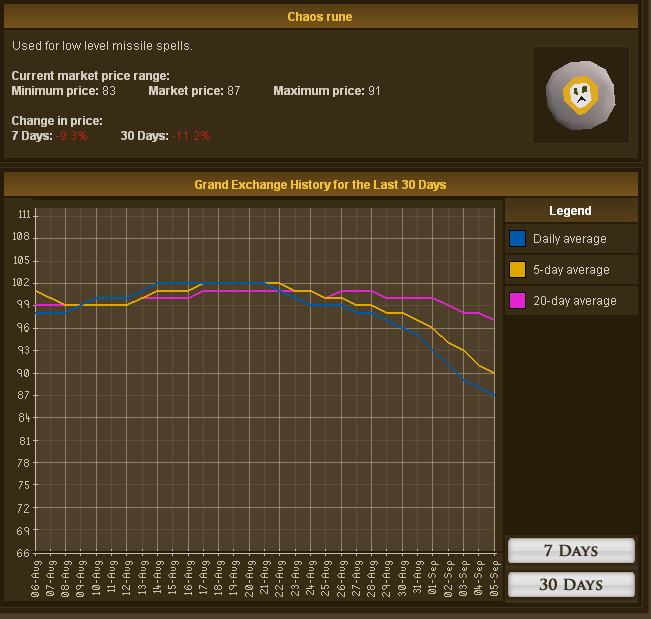 Merchanting is one of, if not the best way to make and lose money. 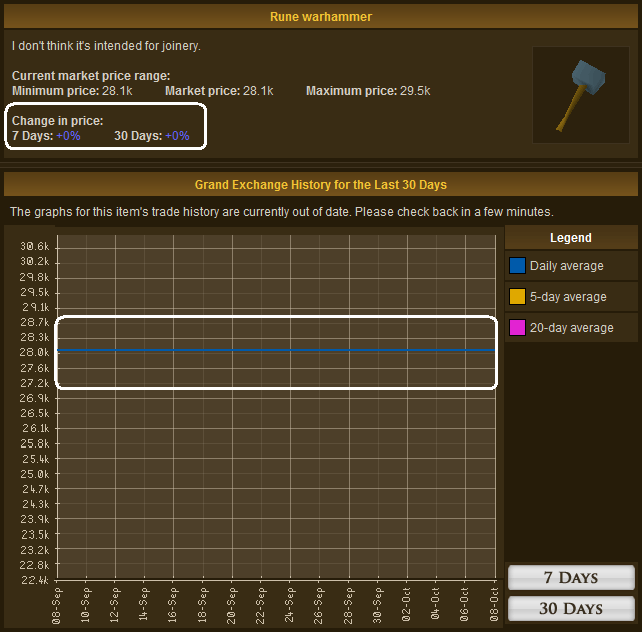 This guide will show you how to merchant with the Grand Exchange. There is more to it than just buying items for the minimum price, and selling them for the maximum price four hours later. Merchanting is an art, and when done correctly can make you rich. This guide will not show you what to merchant, mainly because of the fact that prices fluctuate all of the time, but I will give you tips on how to merchant. Not a member? Not a problem! Even if you are not a member, you can merchant too, but being a member helps, as you get six Grand Exchange slots instead of two. Note: This guide does not show you items to merchant. The items and pictures below are a reference so you can find an item to merchant. Yes, these still may be good items to merchant, but be aware: They are just examples. You can simply walk to the Grand Exchange which is located to the north-west of the West Varrock Bank. If you have level 25 Magic, you can teleport to Varrock using 3 air runes, 1 fire rune and 1 law rune. From the Varrock Square, walk west until you reach the Varrock West bank. Go through it and follow the path to the Grand Exchange. If you have completed the Tree Gnome Village Quest (Grand Tree Quest to use the Spirit Tree at the Grand Tree), then you can use Spirit Trees. You can use the spirit tree from the Tree Gnome Village or in the Grand Tree to teleport to the tree a little bit north-east of the Grand Exchange. You can use an Amulet of Glory to teleport to Edgeville, then cross the bridge and go under the Agility Shortcut, north-west of the Grand Exchange. If you have a Skull Sceptre from the Stronghold of Security, then you can teleport to Barbarian Village. Walk east across the bridge until you reach the West Varrock Bank. Go through it and follow the path to the Grand Exchange. Here is a map that should be helpful if you don't know where to go. Great! Now that you are there you can begin your road to riches! First, if you don't know what an abbreviation means, check out the Rune Dictionary guide for info on what the most common abbreviations are! And, if you have absolutely no clue what you are doing at the Grand Exchange, check out the Grand Exchange Guide! Awesome! Now that you know what you are doing (If you didn't before) we can get started! Let's start off with some basic merchanting rules. Never, ever merchant something that's price never increases or decreases! Unless you wish to make no money, of course. As you can see the price doesn't move at all. This would make it a difficult item to merchant. A good item to merchant would be the death rune. As seen below it goes up and down. Sell when the price goes up, buy when the price goes down. If you are experienced at watching the Grand Exchange charts this shouldn't be a problem. If you aren't don't worry! You will get better over time. Since you will be buying and selling a lot, it is a good idea to have a pencil and a piece of paper to write down what you bought, how many you bought, the cost per unit and the total cost. This way if you forget you will know, to make sure that you don't lose money. Never ever sell for the maximum price! Nobody except desperate people buy things at maximum price. The trick is: A lot of people sell for maximum price, so beat them by selling lower than the maximum price. This way, you will beat everyone selling for maximum price, and it will probably sell faster. But, you can only buy a certain amount of items every four hours, to keep RWT's from Real World Trading"
Short Term Investing is exactly how it sounds. You make an "Investment" for the market price or less (market price is best, so you are almost guaranteed to get the item instantly) and then put it back up on the market for a little less than the maximum price. So for example: Buy an item (not of a high price, so you can buy more) like a rune full helmet or a rune scimitar. Buy 100 (Or the most your money can buy you, don't worry you will be able to buy more later) at the market price, then put it right back up on the market for just below the maximum price. 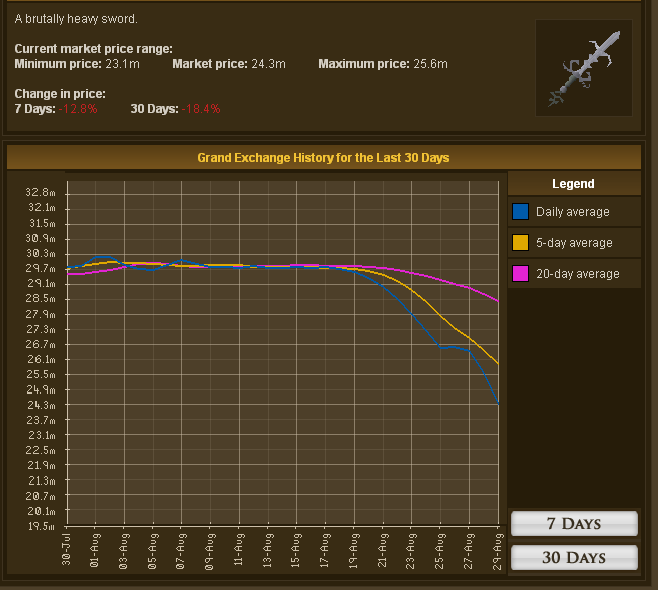 If a rune scimitar's maximum price was 18k, then you would probably want to sell it for 17.5k. This way, you beat the competition. While that is waiting invest in other things, or log out and do something else. If you invest before you go to bed, that would be good because you can just pick up the money in the morning. Although the price doesn't change much you can still buy for about 500-1,000 lower than the regular price. This way you will beat everyone buying for the lowest price, and be closer to the regular price. Then once that is done re-sell it (4 Hour delay) for about 500-1,000 below the maximum price. You will beat everyone selling for maximum price and be closer to the market price. Long term investing is a little more complicated. You must use the Grand Exchange charts. To get to the GE Database, Go to the RuneScape homepage and click Game Guide and then Grand Exchange. 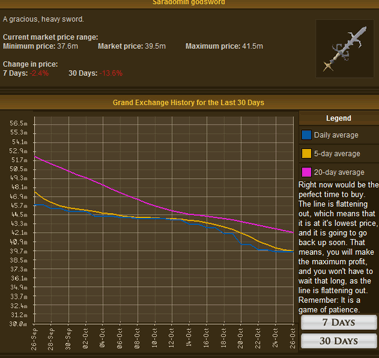 Once there it is recommended that you choose an item that is decreasing by using the charts on the Grand Exchange. Or you can choose an item that you think is going to go up due to a future update. Currently (August 2010), rune armor is about 180,000gp for a set. Due to PvP worlds where you can pk anywhere, rune armor sets are likely to increase in price, because you lose all of your items. So I invested in 15 sets, and now I wait until at least one of the updates comes out. This isn't the best way to do it, but if you have evidence that a price will rise soon, jump right on it! This isn't the "Right Way" to do it, but it can be very profitable. The "Right Way" to do it, would be to use the charts like I said. As you can see Coal has gone down a bit here. You see how the line is beginning to thin out. This is the perfect time to jump right on it. 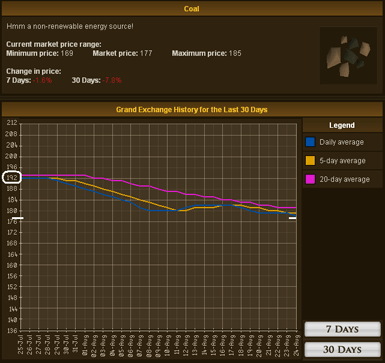 Buy 1-2k coal depending on how much money you have. Don't spend it all so you can invest in other things. The price started at 192, but now it is around 181. If you don't jump on it now, the price will go back up, as you can see from the flattening line. Now wait a few days or weeks depending on how the market is, for the price to go back up and sell it for a little more than the market price for a nice profit! As complicated as it sounds, once you do it a few times, you will be an expert at merchanting! As you can see, the price is going down, so at the time, I bought 5,000 Chaos Runes and sold them when they went back up to above 105gp ea. Like I said, it is just a game of reading charts, clicking buttons and waiting. Now that you are rich you can either enjoy being rich, buy a bunch of rares or great armor to kill people with in Bounty Hunter... or you could double the danger and use "Dangerous" Merchanting. Why is it called "Dangerous" Merchanting? Because it is dangerous. In this kind of merchanting, you will either lose a lot of your money or make a lot more money. Remember this is only if you are a pro at reading and understanding the charts and how prices move. People may lose interest in the item. People may want to buy it for the minimum price. People may just not want the item anymore, and buy a better item. This would be the time to buy. The Grand Exchange goes up and down more on higher priced items. Therefore, it will take about a week or two for the price to go back up. Don't wait for the line to even out at the top, because that is when It will crash again. The Bandos Godsword usually stays between 30 mil and 25 mil when it goes down. 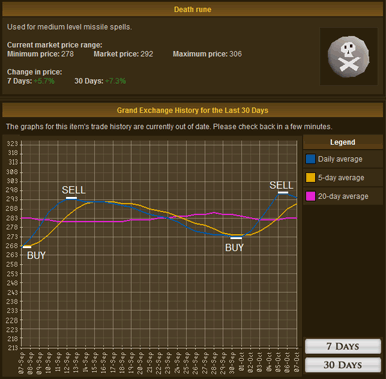 This is the best item to merchant (currently, Jan. 2009) because it is high in demand and the price keeps going up and down at a consistent pace. If you want to merchant others, you can -- just no party hats! Another example here is the Saradomin GodSword. It is going down heavily. If you ever see an offer like this, never hesitate. When you buy it, it will keep going down yes. Then it will start to even out and bounce back up. You MUST be patient. If the line is steadily going back up, don't sell it. Wait until the price starts to even out at the top again, then sell it for maximum profit. The point is, it is dangerous, but if you play your cards right, you could make an easy 10% profit. Warning: If you decide that you want to buy an item that's prices doesn't change, be warned you will not make money, and will most likely lose money. Do not blame anyone except yourself if you lose or make no money from this. We are warning you right now that you will not make any money from doing this. Things like party hats and Christmas Crackers, that are rarely traded and whose prices don't move will not make you money! Set merchanting is an interesting concept indeed, though it is very profitable. Set merchanting sounds complicated, but in execution is very simple. If you were to go to the Grand Exchange and buy all the pieces of a rune armor set individually, put them into a set and sell them for market price, provided the buyer isn't purchasing for more, you will make no money. 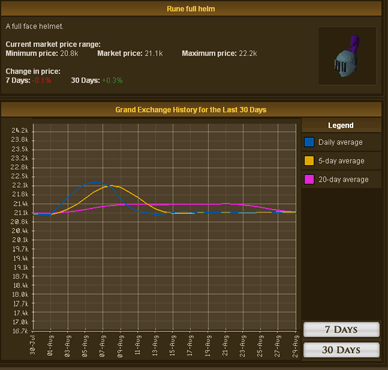 But if you go to the Grand Exchange and buy each piece of a rune armor set for a little less than the market price, put them into a set (to make profit and to avoid four hour trade limit) and sell for the market price you would make a profit. Now if you were to buy 5 sets of rune armor, you would make 10,000gp, as a 2,000gp profit per 1 set X 5 = 10,000gp profit. All you have to do is buy 5 of each item for lower than the market price. Do not buy for the minimum price, as nobody sells for minimum price. For the higher priced items like the Rune Platebody, try buying for 52,000. For the Rune Kiteshield try buying for 42,500. It isn't that complicated. Just make sure that you don't buy each piece for the market price, or you wont' make a profit! Note: Remember, these prices may not be accurate - this is only an example! 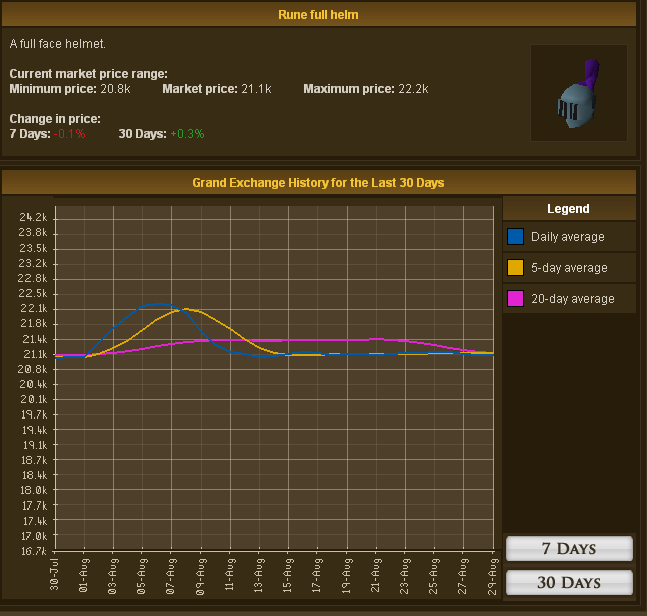 Check the Grand Exchange for the latest price info. Well that is about all there is too it! Don't buy items that's prices don't change, don't buy for minimum price when short term or long term investing, and don't sell for the maximum price when selling something. When you get enough money to "Dangerous" Merchant go for it! I hope this guide has helped you make money.